A review of our Perth presentation of Line Describing a Cone, 2005. The idea of walking into a smoke filled room to be part of an event is quickly becoming a thing of the past. However, Anthony McCall’s Line Describing a Cone demands such an environment to truly appreciate the impact of his innovative work from the ’70s. Entering the room was an unusual experience as the crowd disappeared beyond the fog and a single beam of projected light captured not only the attention, but also the fingertips and hands of the audience as they played with the medium. The half hour evolution of the cone’s arc lit the faces of many Western Australian art identities and enthusiasts who had taken the opportunity to witness and engage in this three-dimensional, unique participant-driven experience. Artist Lucas Ihlein, instrumental in the event and its delivery, described his passion for ‘Expanded Cinema’, designed to extend and expose the cinematic apparatuses to create a live experience for the audience. Throughout the film, the crowd roamed around, within and into the projected physical space. Aside from fellow attendees, there were no images or theatrics to distract you from the raw and abstract understanding of cinematic projection. Yet there was still a climax in the film as the two streams of light drew closer to finally complete the cone. The projector becomes the source, yet it was the audience’s management and manipulation of the projected light that was most fascinating and the Bakery Artrage Complex provided the ideal space to explore this light sculpture phenomenon from every vantage point. Take advantage of the rare opportunity to see this work, as it evokes elements of your personality that respond to an external stimulus that is both inviting and memorable. The following review was originally posted on a blog called File Thirteen, back in 2001. We linked to it in 2005 when we organised our first Australian tour of Line Describing a Cone. The File Thirteen blog doesn’t seem to be online any more – the review is on the Internet Archive, but we’ll re-post it here for an extra backup, and because we think it’s a nice piece of writing. Perhaps the most original performance art film ever created, Anthony McCall’s ground-breaking 1973 “Line Describing a Cone” can be summed up pretty basically. 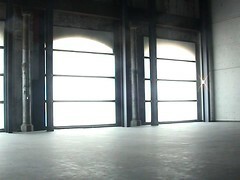 McCall uses a projector to create a light beam that runs through a space filled with smoke. His 30 minute film begins with solid black; soon a single point appears, causing a shaft of light to be emitted across the room. Finally, the dot builds, becoming a line, than an arc, then semi-circle, before finally being completed as a circle projected on a black. This process takes about 30 minutes. 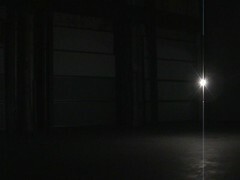 When finished, the light beam emitted from the projector, through the black film with circle drawn upon it, shown across a smokey room, appears to be in the shape of a cone with tip at projector’s lens and base at the wall on which the light beam is projected. The curious thing about this film is that the audience is urge, in fact expected, to not simply sit and watch the film, but to move about the room (where there are no chairs) and inspect and play with the light beam. This becomes fascinating as the projected light beam can be interesting when viewed from different angles about the room. Also, the audience playing in the light beam can create myriad interesting visual images. It’s rather astounding for something so seemingly simplistic. By creating a film, and determining the space and manner in which it should be projected, McCall creates a “performance film.” “Line Describing a Sphere” is perhaps the first (and only?) avant-garde “audience participation film” as well. Watching the film, in a pitch black space, one initially moves through the space with trepidation, afraid that they will run into another audience member. Recollections of bathhouses and adult book stores struck me in this early period of the film. But as the light beam projected grows and eyes become adjusted to the space, one begins to move more comfortably around the room and experiment with the context of the piece. The blackened room becomes a playground where our imaginations and creativity are allowed to flow. It is interesting to note that if this film was shown to children, they would play quite freely in the space and with the projected lights. But adults are far more restrained and aware of others’ “personal space.” We are curious yet cautious, experimental yet apprehensive. We don’t want to diminish the experience for the others in our “audience.” So, sadly, we don’t play as freely… at least initially. But as the film unwinds during it’s 30 minute running, we become more free and more relaxed. Eventually, everyone begins to play in the light and often the experience of seeing someone else playing in the light is as amusing, interesting, and surprising as our own self-revelations. The audience becomes more than simply just a group of strangers. We become “audience” sharing an experience. Because the film is silent, we become more relaxed about speaking out or laughing or showing awe verbally while as a group. It becomes a heightened “shared” experience. It brings a sort of “togetherness” to the group. It’s very “70’s” and very communal. “Line Describing a Cone” is beautiful in it’s simplicity. It’s amazing it took someone over 8 decades after film was invented to create such a piece. But the beauty of the film is it’s ability to incite imagination and curiosity and experimentation in a group of random viewers who all happen to be sharing the same cinematic and artistic experience. This is as much a film as a statement on film. The piece shares many common bonds with more traditional films. It takes film to a more basic level where audience interacts more exactly with film. Like all film, it requires no live physical person to represent the film at it’s viewing (except perhaps, like all film, the projectionist). It requires only film, projector, projector operator and audience. And like all film, the audience often has shared reactions to the playing out of the film. There is shared moments of laughter, awe and interest, even if we are strangers at the event, even if we all arrive and depart separately, even if all of our perspectives are different. And, after all, isn’t that one of the greatest magics film has to offer? Note: Special projection requirements – see below. Line describing a cone is what I term a solid light film. It is dealing with the projected light-beam itself, rather than treating the light-beam as a mere carrier of coded information, which is decoded when it strikes a flat surface (the screen). The film exists only in the present: the moment of projection. It refers to nothing beyond this real time. The form of attention required on the part of the viewer is unprecedented. No longer is one viewing position as good as any other. For this film every viewing position presents a different aspect. 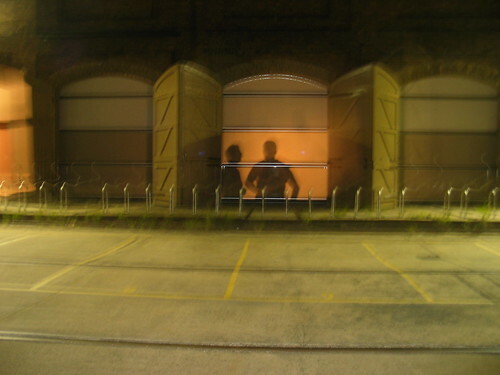 The viewer therefore has a participatory role in apprehending the event: he or she can – indeed needs to move around, relative to the emerging light-form. Please note: there is, obviously, especially for one-time showings, a certain necessary improvisatory spirit. So these specifications should be taken as guidelines rather than imperatives. However, I can say that the most successful showings that I have witnessed have been reasonably close to these recommended conditions. That projector should be inside the viewing space, not inside a projection booth. The projection space should be entirely empty of chairs or other furniture. The projection space must be absolutely pitch-dark. Owing to the delicate nature of light, even a slight spillage of ambient light from poorly masked windows or doors can seriously affect the film’s visibility. A five or six-inch-wide strip of thin black card loosely looped over the top of the projector casing to minimize light spillage from the heat vents up onto the ceiling, can also help. Whenever possible, use a 16mm projector with a 350 watt Xenon lamp (and this would be essential for the longer projection throws). The Xenon lamp is significantly brighter than that of a standard projector. The light of the beam is visible through its contact with tiny particles in the air, be they from dust, humidity or smoke. The most effective and controllable method of ensuring visibility is by hiring or borrowing a “Hazer”. 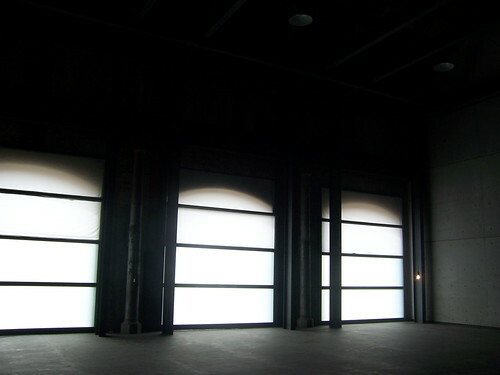 These can usually be rented by the day from theatrical or lighting supply firms. See, for example, the Martin/Jem ZR24/7 Hazer. A Hazer fills the projection space with a safe, odorless haze similar in appearance to a sea mist, which is extremely effective in rendering the beam of light palpable and visible. Louise Curham and I first “met” Anthony McCall’s Line Describing a Cone in 2005, when we took it on an Australian tour to Kellerberrin, Perth, Melbourne, Sydney and Brisbane. …and joy arising from every subsequent presentation of Line Describing a Cone, which never failed to delight those in attendance. Ten years later, we’re in the process of presenting our second “tour” of the Cone. We brought the 16mm print out from LUX in London to show at the CEMENTA festival in Kandos (about 4 hours inland from Sydney). Perhaps this was to some extent an effort to exorcise the demons of that failed Kellerberrin screening. Both Kandos and Kellerberrin are small towns a long way from any sort of projector spare parts; both places are unfamiliar with the experience of expanded cinema. LI: Youâ€™d said you were zoning oout? CF: what does zoning out mean? Like a feeling that I didnâ€™t know I was there but I knew I had been there. Itâ€™s really strange. LI: how much time passed do you think in that period? CF: five minutes? I donâ€™t know. Also this being framed by something that happened previously. It almost felt like an anchor. I found something vaguely comforting about the fact that something like that was being re-created. The fact that it was done in the past lent it some weight? It also felt a bit naughty coming in thereâ€¦I was running out of the house. Iâ€™d been paralysed by wasting time, I could go in there and switch off without wasting time, there was a guiltless non-doing about it that I really enjoyed. The scale of it just shifts. The change in physicality. Like when you stand on somewhere really tall and you feel your stomach just move. That caused a shift in me that kicked something off, just the scale of it, it was big and enclosed, that was a defamiliarisation effect. I felt a smoothnessâ€¦ like I was entering into something very smooth [â€¦] the light has something to do with it. And all the grey tones in this place. [â€¦] A slightly clinical feel. [â€¦] I couldnâ€™t help noticing the curtains. Some kind of notion of theatre. Although I quickly realised they were just here, already a part of the space. I felt myself a part of the structure. [â€¦] As far as this being an event [â€¦] the physical structure and the structure that youâ€¦ that this event isâ€¦ it resonates with the notion of intervals and spaces. I quickly felt some kind of a longing â€“ to be here, for much longer. â€¦ Itâ€™s a long film, and Iâ€™m only here for just a quick glimpse. So I feelâ€¦regretful. I started wondering whether lots of conversations will happen â€“ is it a social space? A meditative space? Conversation can be great way to pass the time. The screening follows along from a residency that Lucas Ihlein and Louise Curham have been doing in the majestic Track 12 at Performance Space’s new home at Carriageworks. A few folks who we invited to experience our private “screening” of Long Film for Ambient Light have begun to filter back with their thoughts after the event. Mike and Deborah visited in its last half hour, late Saturday morning the 17th of March.